I hope you all haven’t thrown out all your pumpkins yet. If you want to make some delicious pumpkin pies, pumpkin breads, pumpkin muffins and even pumpkin popsicles then it’s time to hit the kitchen. I make my pumpkin puree just a little bit different than most. Most people bake the pumpkins, and I agree that this is the best way to keep in all the nutrients. However, I notice that my breads turn out extra moist when I use the following method. You can do the same method for squash as well. 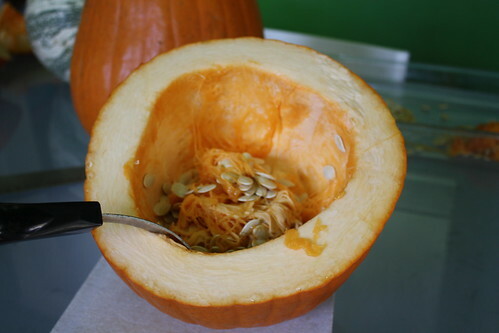 I did this with our cushaw squash, as well as with one of my pumpkins. Only three more to go! 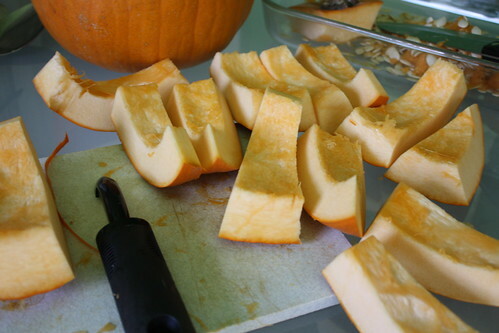 Step One: Cut your pumpkin (or squash) in half and remove the seeds. Step Two: Cut into small pieces for peeling, then cut into smaller chunks. Place peeled pieces into a pot. 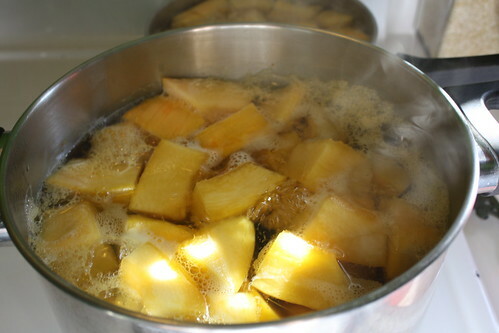 Step Three: Add water and bring to slight boil and reduce heat to simmer. 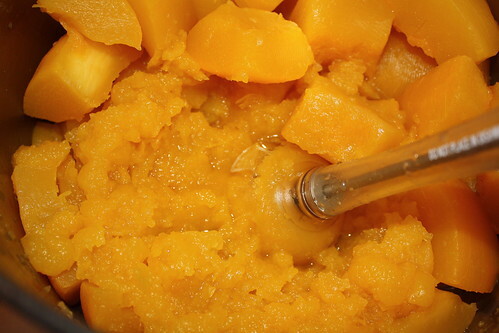 Step Four: Once you can easily stick a fork in and out of a piece (should slide in and out), then drain the chunks, let them cool and puree with a hand mixer. At this point you can bake with your puree or put it into containers for freezing. Now you have a healthy and very inexpensive ingredient for your holiday baking. This also makes excellent, healthy baby food as well, so be sure to set some aside for your little munchkin. Check out more pumpkin from scratch recipes. Seems like a lot of extra work to get a little more water in your pumpkin! Try adding a little water back after baking, and you will get the same result without losing the nutrients. That cushaw squash looks delicious– wish I could find some seeds to grow it! Does it have to be a “sugar” pumpkin? We have a smallish regular pumpkin. I’d like to have some in my freezer! You pretty much use any pumpkin, although I wouldn’t try it with those teeny tiny ones that are for decoration. I bake mine in the oven, just cut in half with alittle water in the bottom of the pan. The skin is very easy to cut off when cooked and it doesn’t get watery. I used to cut and peel and boil…it takes WAY to long and a LOT more work than it is worth. I cut them in 1/2, put them in a baking pan with about an inch of water. Bake at about 350* until done. Then I either scoop the cooked pumpkin out or just pull the skin off. Throw in the food processor and done! I use mine in breads and for pies. I have never had any problems with them being to dry or to watery. Um, so Crystal, did you peel off the skin/rind? Or leave it on when pureed? I peeled it before it went in the boiler. I steam mine skin on and they are very moist. 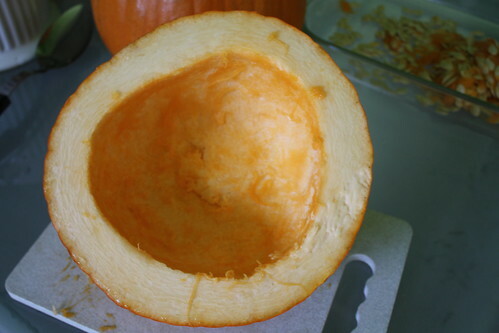 I cut it into quarters usually and scoop out the seeds…the skin just peels right off when it’s done. Can we boil with the skin on? Or does it taste bad, if we boil with skin on and remove the skin later?